So it’s a sidestep and I am not sure that I can see the point of it. A sidestep might carry a crab forward, but I fail to see what it does for this story. There is no denying that it is a popular book though; it wouldn’t have the word ‘bestseller’ on the cover if it wasn’t. 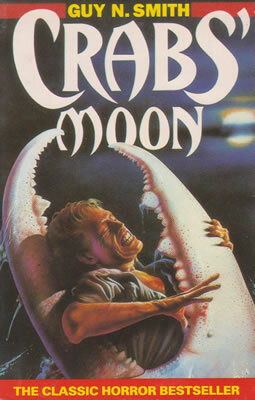 It is worth noting that Crab’s Moon is not the second of the Crabs series of books. It was written eight years later and between it and Night of the Crabs there are three other books: Killer Crabs, Origin of the Crabs and Crabs on the Rampage. I have not read these as yet, but I presume that they must continue the story proper. Crab’s Moon is 284 pages long and is split up into 17 chapters. However, chapter 3 is merely a chapter copied from the first book and bears the note ‘As related in Night of the Crabs.’ The same sort of thing happens again later on in the book, but only for part of a chapter. This annoyed me a little because I wanted new story, not a recap. Having said that, if I was some who hadn’t read the other three books before I read Crab’s Moon, I might have been grateful for the information. Professor Davenport, who was the main character in the first book, turns up from time to time in Crab’s Moon but is not really a major player in the story. The two main characters this time around are Irey Wall and Gordon Smallwood. Irey’s Husband has gone on a fishing trip with his mates and bundled Irey and their two children off to the Blue Ocean (what a guy!) Gordon is one of the camp’s Greencoats and a thoroughly decent bloke as well. Gordon’s girlfriend Jean Ruddington is also a Greencoat, but leaves the camp, in the middle of the crab invasion, on the pretence of visiting with her sister. Gordon is, naturally, more than a little worried about her, but has a job to do and stays on camp. It is fair to say that Jean would not have wanted him along anyway. Like Irey, Gordon deserves better from life. Basically, Crab’s Moon is the same old story but seen through different eyes. As I said earlier, I don’t really see the point of it, but the book is well written and it certainly is not boring. The crabs cause their usual carnage, of course, and there are plenty of characters who meet messy ends at their pincers (Clickety-click). So, if you enjoy scenes where people are disembowelled or cut in two (or three, or four—clickety-click-click-click) by the local sea life, then you may want to add Crab’s Moon to your reading list.